Auditions are held each year in early September and January. 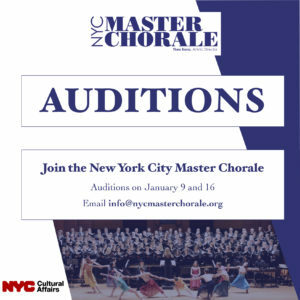 If you are a trained singer with strong sight-reading skills and are interested in auditioning for the New York City Master Chorale, please contact us at info@nycmasterchorale.org to set up an audition time. You will be asked to sing for our Artistic staff. Please prepare a solo of your choice; you will also be led through vocal exercises to show your range and asked read a brief sight-singing exercise. An accompanist will be provided so please do bring sheet music. No need to bring a headshot or resume. The whole audition should take 10-15 minutes and you will be notified of the audition outcome within the week. Rehearsals are Wednesday evenings, 7:00 – 9:30pm at Pearl Studios, 500 8th Avenue, 4th Floor. Singers are expected to attend rehearsals in their entirety and attendance at dress rehearsals is mandatory. Participation in concerts is contingent upon rehearsal attendance. We recognize that business and family commitments may sometimes interfere with rehearsal attendance, at which time the singer should contact his/her section leader. Members who miss more than three rehearsals in a given concert rehearsal period will be required to meet with the Artistic Director to sing for and/or speak with her to determine if the singer is adequately prepared for the performance. Singers are expected to sing in every scheduled performance unless an exception is granted by the Artistic Director. Membership dues for the season are $230. Payment of dues is a condition for participation in performances with the Chorale. Singers may apply for an extended payment plan and a limited number of partial scholarships may also be available. Scholarship recipients are expected to participate in volunteer activities benefiting the Chorale, as agreed upon with the Personnel Manager. Additional fees apply for concert attire, scores, and a black choral folder.